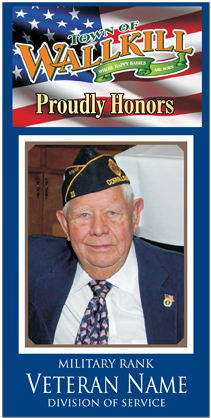 In an effort to highlight our veterans and armed service men and women who serve our country, the Town has begun a program in which families can purchase banners to be displayed at our Veterans Memorial Park. Each banner will be hung for about 4 months and there will be two rounds of hanging. First round May, June, July and August and the second round September, October, November and December. The town will hang the 12 banners on a first come first serve basis with a preference to Wallkill residents. Only 12 banners will be hung each round and the parks department will hang the banners weather permitting, as well as, take them down during the appropriate months. Below are a simple set of questions that you must answer and information you must provide to become eligible. D and M signs of Middletown have agreed to create these banners for this program at a frozen rate of $95.00 for one two sided banner. Please understand you do not lock your banner in for purchase until it is paid in full through calling 845-343-9727. Below please answer the following questions. Please enter the name of your service member. Please enter the area of armed forces. Please enter the time of armed forces service.